KIWOOM Securities is likely to become the third internet-only bank in South Korea. Top ICT (Information Communication Technology) businesses such as Naver, Interpark, and NHN Entertainment announced their intentions of not applying for approval of new internet-only banks. 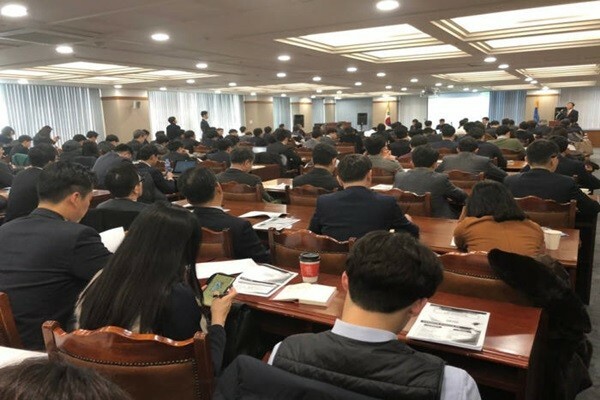 Financial Services Commission (FSC) and Financial Supervisory Service (FSS) held a briefing session on the 23rd for approval of internet-only bank and introduced main standards for new approvals. More than 120 personnel from 55 businesses attended this briefing session. Financial industries such as KIWOOM Securities, Kyobo Life Insurance, and BC Card showed interests. Practically every financial industry such as credit finance companies, insurance companies, and financial investment companies showed interests. Out of 55 businesses, 21 businesses were financial companies. FinTech companies also showed high level of interests towards internet-only bank. 13 FinTech companies and non-financial companies such as law firms and accounting firms were responsible for more than half of attendees. Although many businesses showed interests towards internet-only bank, only KIWOOM Securities was the only one that showed active participation. Although financial industries such as commercial banks were in attendance at this meeting, they were in attendance because they were simply just interested in internet-only bank. KIWOOM Securities is the only one so far that has established a consortium that is expected to have various partners such as Kyobo Life Insurance and SBI Holdings. Financial authorities are additionally looking at whether composition of shareholders of an internet-only bank can contribute to convergence between finance and ICT during this approval process. “In case a company that is not related to FinTech at all enters internet-only bank business, it is hard for us to determine that company has ability to converge ICT and finance resulting in negative score.” said a representative for FSC. There is a possibility that there will be businesses that are looking for niche markets as top ICT businesses did not attend this meeting. Many representatives who were at the meeting announced their intention of entering internet-only bank market through combination of small and medium companies. There is a chance that businesses such as Naver and Interpark that are not interested in internet-only bank at the moment will be interested in it in the future. Some predict that ICT businesses that were concerned about their strategies being public confirmed about detailed information through law firms and accounting firms.